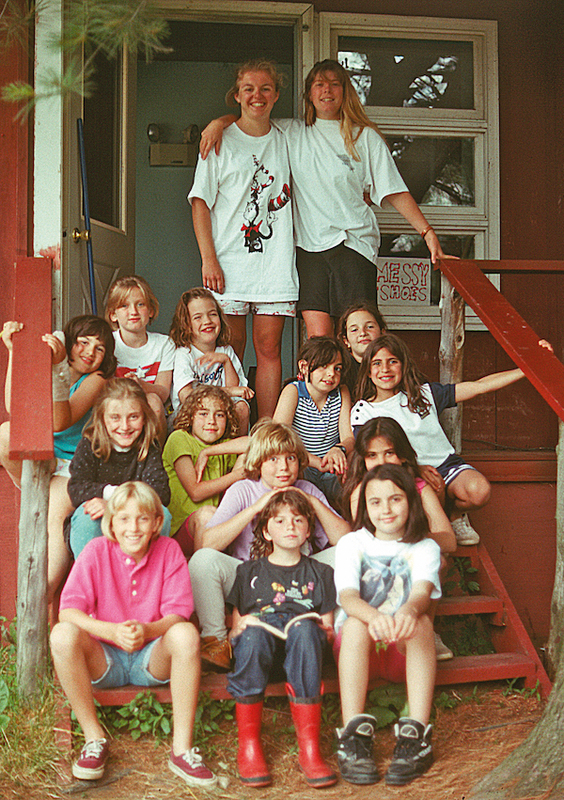 FOURTH GENERATION camp visitor is Harry Chandler’s daughter, Margot (in pink shirt, lower left), circa 1990, at Camp MacCready in New York’s Adirondacks. “Away camp” provides very special experiences for youngsters. Harry Chandler, who lived on June Street, as did his mother (and his father lived for a while on Hudson) reminisced with me recently about four generations of his family experiencing camp, circa 1937, 1963 and 1990. His stories ring very true to me because I spent most of my formative summers in the Sierra Nevada near Mammoth Lakes. So, me first! I spent summers from 1958 through 1966 as a camper, then junior counselor, then counselor, at a High Sierra camp, Bill Badham’s (and eventually Jerry West’s and Les Richter’s and Don Drysdale’s) All American Village in Mammoth Lakes. My summer camping tenure actually started earlier — with local day camps — under the tutelage of Badham (“Baddy”), the physical education director (and, later headmaster) of Carl F. Curtis School. I attended Baddy’s day camps in Los Angeles (Boys’ Athletic Club, then Holiday Hill). In 1958, I went away to Holiday Sierra (later renamed All American Village) at Mammoth Mountain. When I first arrived in Mammoth, I was in 5th grade at Third Street Elementary School. From 7th grade through and including 9th grade, I was at Black-Foxe Military Institute (now condos on Wilcox at Melrose!). Then I was at boarding school in New Jersey. But, all those summers, and during my first summer at Cal (summer of 1966), I continued my attendance, then employment, with Bill Badham at Mammoth. After that, and given the Vietnam War era, my next two summers did see me at “camp,” but it was with other Army ROTC students, first at Fort Benning, Georgia, and then at Fort Lewis, Washington. My memories of the Sierra summer camps are fonder than those of the U.S. Army’s summer camps. But both experiences had positive impacts on me, and I know that summer camp is a great gift for young people and their maturation. A well-known leader in the American summer camp movement was Manny Vezie. A former football player under legendary coach Knute Rockne at Notre Dame, Vezie came to California and founded Gold Arrow Camp at Huntington Lake, in the Western Sierra Nevada mountains, in 1933. The camp continues to this day, with multi-week sessions from June through August. ANOTHER generation attends Gold Arrow Camp. In white tee shirts in 1963 are Otis Chandler’s son, Harry (on right), and Harry’s cousin, Bob Brant. The “Los Angeles Times” family of Gen. Harrison Gray Otis and his son-in-law Harry Chandler had a subsequent generation Chandler, Harry’s son Norman, manage and publish the paper from 1926 to 1960. Norman married Dorothy Buffum, and their son, Otis (the publisher from 1960 to 1980) was an early camper at Gold Arrow Camp. 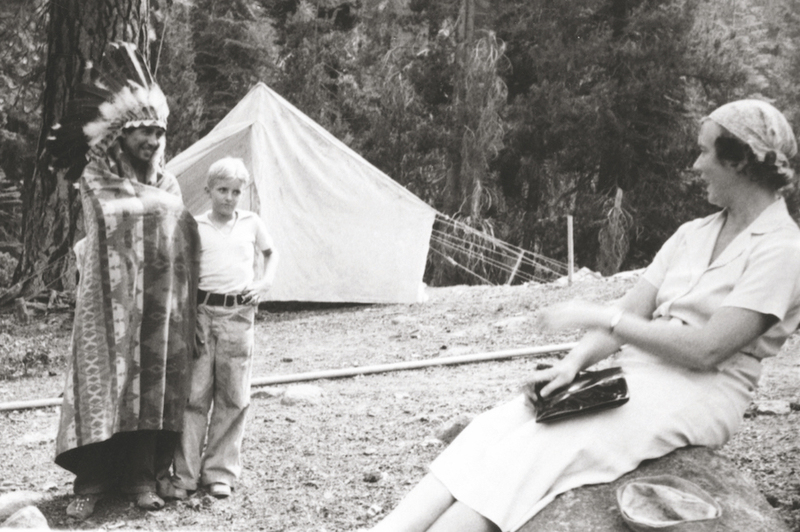 YOUNG OTIS CHANDLER, circa 1937 at Gold Arrow Camp in the Western Sierra with man in Native American regalia, while Otis’s mother, Dorothy Buffum Chandler, watches. Otis and Marilyn (“Missy”) Chandler’s son, Harry, also attended Gold Arrow, and he provided the Chronicle some of the photos that accompany this story. In one photo, Harry’s grandmother Dorothy Buffum Chandler is seen sitting on a rock or log while visiting Harry’s father Otis at Gold Arrow Camp, circa 1937. 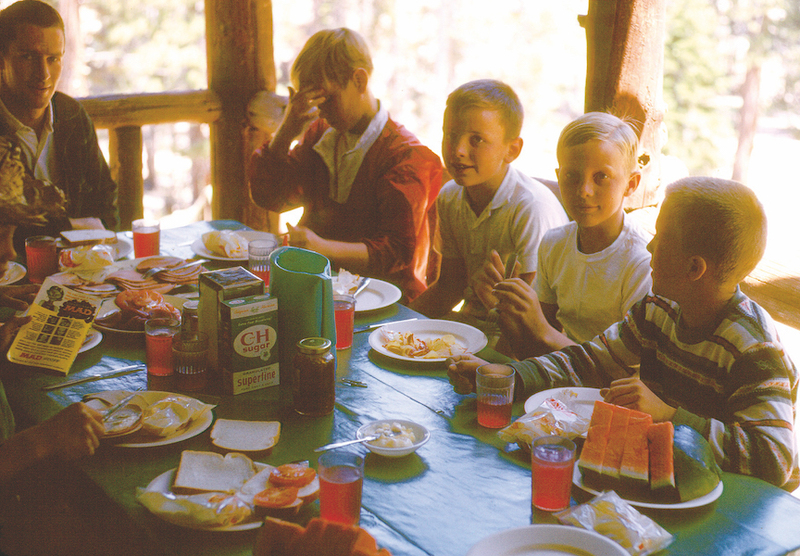 About 25 years later, Harry was a camper there, and we have a picture of him with his cousin, Bob Brant, circa 1963. In about another 25 years, Harry’s daughter, Margot, also was a camper at Gold Arrow, and she later thrived at a camp in the Adirondack Mountains, Camp MacCready. That camp is part of a camp operation founded in 1905 that is the country’s longest running camp under continual ownership of one family. Summer camp is a great adventure and a learning experience, and there are many terrific camps, both here in town and farther away, for local children to enjoy. I’ll be jealous!